These reports identify the gemstone under examination, along with presence or absence of treatments and their methods. The stone may be loose or set in a piece of jewellery or in a bead string. » identification of the stone: by mineral name (group/species/variety where applicable), prefixed by whether it is natural or synthetic, man-made product or a glass. However, in case of synthetics, species and group names are not mentioned. » comments: include any additional information on presence or absence of treatments, damages, special optical effects such as colour change, and any information which may help to interpret the results on the report. 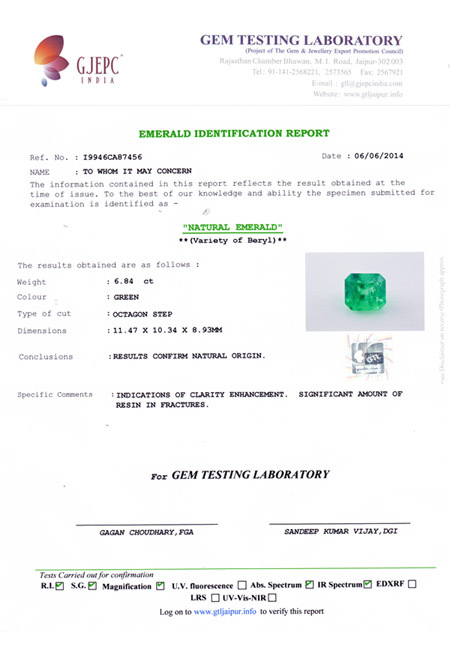 In case of emerald identification reports, along with the nature of treatment and type of filler, its quantity is also mentioned in broad categories as significant, moderate or minor.